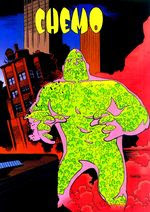 Chemo is a translucent golem created by the wizard used by Ramsey Norton to attack the realm of Midlania. However, a group of adventurers were able to kill Ramsey and trap Chemo using an enchanted chest. The adventurers then left the chest in a nameless dungeon, assuming it would be safe.